In addition to the nice appearance, a cornice (horizontal molding that stretches on the whole length of the wall, on the upper part of it) that is well-maintained evacuates properly the rainwater. What do you mean by cornice restoration? Cornice restoration includes reparation, which means replacing th e rotten wood in the case of wooden cornices, replacing damaged metal sheets, repairing ancestral cornices, repainting cornices, and much more. 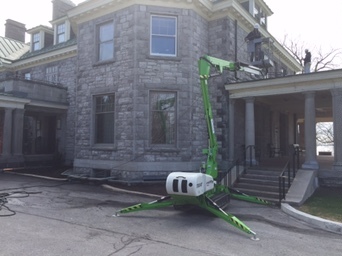 It’s very rare that it’s necessary to change entirely a cornice, as they are usually built in order to resist to the Quebec’s rough climatic conditions. In Montreal, some cornices are very old. In the 1800’s, cornices were all made of wood, and there still exist a few. Ancestral cornices give a heritage value to a building, and this is why we don’t want to remove or modernize them. For any wooden cornice, we start with a pressure washing of the surface using a specially conceived tool. The water pressure will be set in a way that the wood won’t be damaged. We replace the pieces of rotten wood, but try to keep the original material when possible to preserve the heritage. After the surface was left to dry completely under the sun, we apply either an alkyd latex paint or a 100% acrylic. The latter is more expensive, but extremely durable. If your building is younger, it may have a galvanized sheet cornice. Galvanized metal rust after a few years, which makes it difficult for the paint to stick to it. We recommend to first apply primer coats so the rust won’t come through. 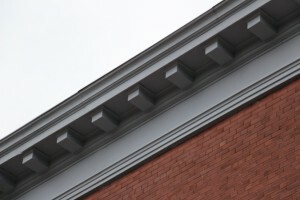 Numerous contemporary cornices are made of aluminum. To paint an aluminum cornice, we advice you to start with a pressure washing to clean thoroughly the surface and get rid of all dirt which would otherwise reduce the paint’s adherence. In the case of very dirty cornices, it could be also necessary to proceed to a manual or electrical sanding. We then can add a coat of powder paint, which makes the surface resistant to oxidation, and then we apply a coat of acrylic paint for the finish. At Findecor’s, we paint and restore everything on your building, including elements located high up: cornices, parapets, flashings, dormers, lintels, awnings, aluminum and iron sheets, damaged tiles, window frames, shutters, etc. Of course, we respect the ancestral construction methods and we do the restoration when necessary. You have a cornice to restore or to repaint? We offer free estimates in Montreal! Contact us to make an appointment now.